The average 401(k) balance on retirement accounts registered with the Vanguard mutual fund company was $101,650 in mid-2014. That’s up a whopping 80% since the end of 2008. The results were even more impressive for 401(k) plan participants who continuously maintained and contributed to their accounts from 2008 to 2013. Their average balances shot up 182%. According to the Employee Benefit Research Institute, the surging stock market has bolstered workers’ confidence that they will be able to retire comfortably. But big 401(k) balance gains can be a smokescreen that blinds employees to just how much they need to sock away for retirement. HR pros can provide a reality check when talking about defined contribution retirement benefits. Remind employees that financial planning experts recommend using a 4% rule for safe withdrawals from retirement investments—in other words, tapping just 4% of a 401(k) per year for spendable income. 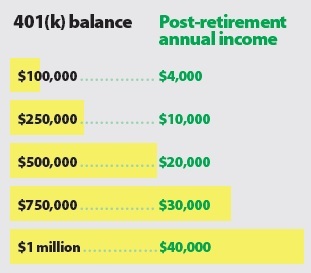 That means a $100,000 balance will yield just $4,000 in annual income. Urge employees to save more by showing them the figures shown at left. Are we allowed to require employees to receive their wages through paycards? When register drawers are short, may we demand repayment out of cashiers' pockets?